Have you ever watched Vincent Price's The House on Haunted Hill (1959)? Then you're familiar with the house! You know the one . . . it's the back-ground for Price's disimbodied head during his prologue! Maven has always had a problem watching this house in the prologue. Her father was a top-notch contracter so she noticed that the Ennis-Brown exterior didn't match the interiors shown in the movie. Click on the photograph at right for the link that will show you the history, other interior shots, etc. This is the driveway shown in the film from the Franklyn Lloyd Wright house. 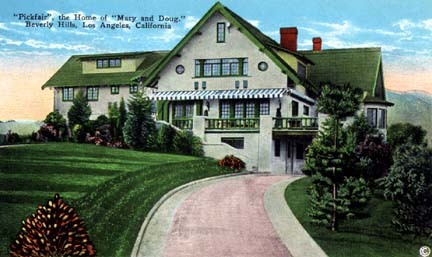 It was build in 1924 for Charles and Mabel but has had extensive structural problems because of earthquakes and weather. The repair bill seems to have gone up to $10,000,000 since the last time Maven checked within the last two years. The repair bill is $10,000,000 . . . .
Makes you sudder at how much the house cost to build to begin with! Let's not even think about the replacement costs today! !